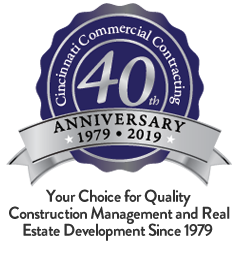 Cincinnati Commercial Contracting uses 3D/Building Information Modeling (B.I.M) for each of our construction projects, at no additional cost to our customers. This very innovative tool is not commonly used in construction today, and it clearly differentiates our process. Our trained B.I.M. technician transforms two dimensional line drawings into a four dimensional/virtual reality mode. Clients actually see virtual renderings of their project. This allows you to virtually walk through your space. We bring 3D/B.I.M./Virtual Reality technology to every project. Most importantly, it allows us to uncover design issues before construction begins, which eliminates change orders, errors and delays. This can mean significant cost saving for you. Panoramic renderings. We give you a QR code to scan from any device and you can see the virtual 3D renderings. No more paper plans! Building walk-throughs. Your team can review all aspects of the project before construction begins. Exterior renderings. See your building as it will appear day or night. Review parking, lighting and signage. Polished renderings. You can share our B.I.M. work with investors, marketing team or leasing agents. Property management resource. You will have a complete set of renderings and plans as historical documentation for any future needs. What Are The Benefits of B.I.M. Clash detection. We see and resolve issues before construction begins. That means much fewer change orders. Faster scheduling. We can greatly reduce or eliminate time spent to correct problems during the course of each project. Bottom line, B.I.M/3D modeling saves our clients time and money. Learn more here.